Like Megan Whalen Turner, I discovered Sherwood Smith back in 2007 through Shannon Hale’s blog. After reading that interview, I went to a local bookstore, grabbed a copy of Crown Duel and promptly fell in love with Meliara, Vidanric and the world of Sartorias-deles. I’ve been a huge fan ever since. 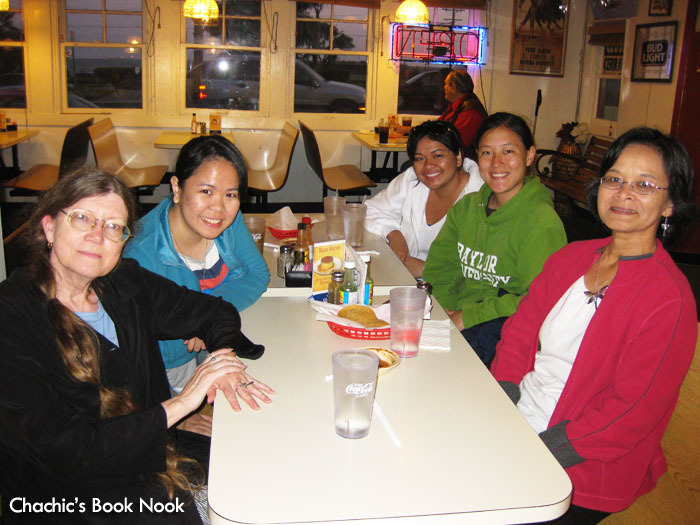 I knew that Sherwood loves the Queen’s Thief series because when I was in the States in 2009, I was lucky enough to attend a joint Sounis–Athanarel meet up. 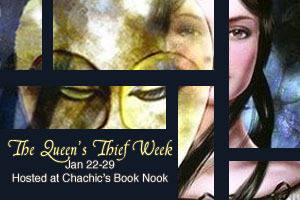 I asked Sherwood to write a guest post for Queen’s Thief Week and she graciously accepted. Here you are, folks, a review of one of my absolute favorite series from one of my favorite authors. Take note of the warning about spoilers though and only proceed if you’ve read all of the books. Warning up front: I tried not to be spoilery, but if one is going to riff about four interconnected books, there have to be references to key events. I first read The Thief when it came out. Right away I knew something was up. In fact, the structure of the opening was sufficiently odd that I had to go back and reread it before I could proceed with the journey. On the reread, the cluebat hit me: Gen (Eugenides, the central character and narrator) was hiding something, probably his relationship with the king. But you know the difference between surprise and suspense: surprise is for both reader and characters, and suspense is when the reader knows what’s coming (or thinks she knows) and the characters don’t. The structure of the opening suggested to this adult reader that Gen — apparently so open, ruefully honest about many of his shortcomings — was hiding the real truth from the reader, and little clues along the way bolstered the impression. I read happily, because the trope of sekrit identities is one of my favorites, and the writing was so vivid, so full of wry humor, the world so interesting that I could scarcely put the book down to attend to my daily tasks. Would I have guessed at Gen’s secret had I been a young reader? I doubt it very much. If I’d read this book at age thirteen, I am certain I would have accepted Gen’s pose as an urchin and thief at face value, and thus enjoyed the surprise along with the characters at the end. I think this is one of the signs of a good book — that one can come at it from any age, with the wide spectrum of reading experience, and still find pleasure in it. The debate about what is appropriate for young readers and what isn’t rages on all over the Internet, and I don’t intend to get into it here. Far as I am concerned, young adult books are enjoyed by high schoolers and college students as well as middle schoolers — and adults. Young readers, especially those who love reading, will venture into deeper waters when they feel they are ready. Anyway, back to the book, and the discussion of the event. Since I’d read this discussion, I knew what was coming. Would I have been shocked out of the book if I hadn’t been? No. The foreshadowing definitely set it up. How about as a kid reader? I don’t think so. I’d read some fairly rough stuff as a kid — Lord of the Flies when I was twelve, for example. I was one of those who ventured into deep waters at an early age. Yes, I did get stung hard a few times, and yes, there are even some books I wish now I had never read, but they might not be the ones you would think, or for reasons you would guess. Here’s something I’ve noticed in my decades of working with kids. They have a strong sense of justice, bolstered by that tendency to see things in black and white. Most of those youngsters I’ve talked about this book with were united in agreeing on this point: What happened to Gen was earned. Does that mean he deserved to suffer? No! Readers adore Gen! My teens weren’t articulate about why the event wasn’t unjust, though they didn’t feel he deserved to suffer, but here’s how I see it. Many of us (my hand is in the air) love heroic figures, and Gen is definitely heroic. Some people object to heroic figures as unrealistic, and you get pejorative terms like “Mary Sue” and “Marty Stu” thrown around. Well, (rapping my cane on the floor) I was around when Mary Sue was shorthand for Lieutenant Mary Sue — the character representing the author of many Star Trek fan fictions. Sometimes she was drop dead gorgeous, other times she looked exactly like the author, but one thing for certain: everybody on board the Enterprise was in love with her, talked about her, was amazed by her. Scottie, stumped by some engineering crisis, hailed her solution with relief — Spock, presented with a scientific dilemma, turned to her for advice — Captain Kirk tended to lurk around wringing his hands until she responded to his flirtation. Or (this was pre-slash) he and Spock might fight over her. And, more often than not (because in those days TV episodes had to dial the story back to the starting place because of summer reruns, so nothing ever actually changed), by the story’s end the entire ship of several thousand would be in deep mourning after Lieutenant Mary Sue died heroically saving them. 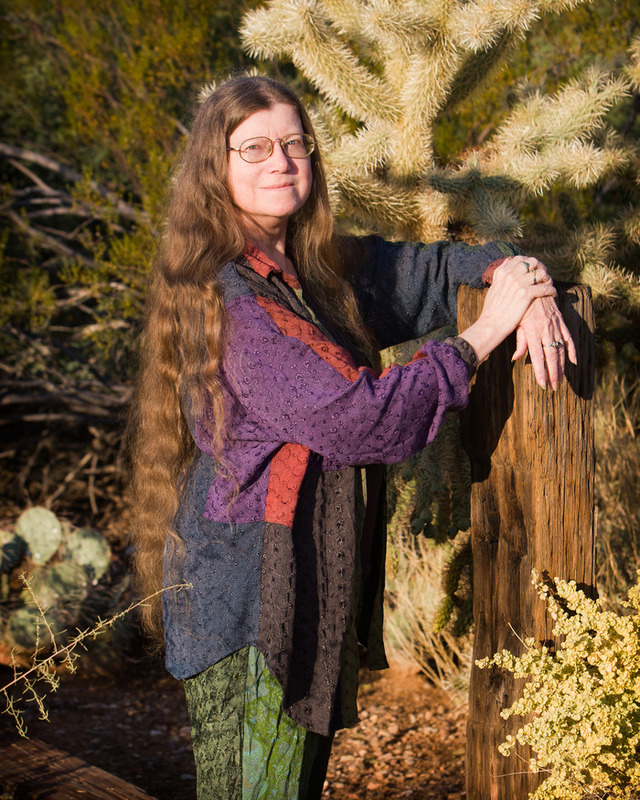 The important thing is that the author told you that Mary Sue was the best, the brightest, the cutest. Or if the author tried to show you, it meant making everyone else dumb so that Mary Sue could be smarter. It meant making the side characters into stick figures who only existed to look at, talk about, and fall in love with Mary Sue. They gave no indication of lives, loves, wits, motivations of their own. That’s the true definition of a Mary Sue: the character that the author tells you is the hero. It’s a pleasant kind of wish-fulfillment story, and sometimes we need a good dose of wish-fulfillment. But the author who gives us a hero instead of a wish-fulfillment central character convinces us of the character’s heroism. That means the hero/heroine demonstrates behavior in the face of adversaries as smart as he, or she, is. Most importantly, the story shows us the cost of heroism. And this is where Gen comes in. In The Thief, Gen largely sails through unscarred, if not completely unscathed. But in The Queen of Attolia, when Gen sets out to do something heroic, he pays the hero’s price. And we are there for every moment of that price, including the emotional fallout. He earned his heroic stature. And that’s one of the things that makes The Queen of Attolia a great book. The Thief is narrated by Gen. The Queen of Attolia opens with a narrator observing Gen, occasionally giving us a glimpse of his emotions. The narrator of The King of Attolia observes most of the action of the book through the eyes of Costis, a young Attolian who thoroughly dislikes the new king. The readers see Gen from a new perspective as Costis deals with this outlander king and how he will fit in with Attolia’s difficult court. When I was a kid, I did what many kids (and adults, truth be told) do: divided people into two kinds. My “two kinds” were what I later came to call survivors and normal. Survivors were those who had discovered that the places in life one expects to be safe aren’t necessarily. Survivors could be those who had lived through an earthquake strong enough to tumble school or home — people whose houses had burned down — people who had had war or pestilence sweep through, people whose adult guardians had turned out to be more dangerous than all the above things. People who had lovely safe homes, but lived through hell at school, yet the adults who cared for them seemed to be oblivious. Survivors survived dramatic events, or painfully private, personal ones. Survivors did not all react the same. In one instance, a family with a pair of twins narrowly escaped a sudden house fire. In after years, one twin talked about the fire a lot, saying it was exciting, even awesome, and ended up as an adrenaline junky, getting into a lot of trouble until finally ending up as a Navy Seal. The other twin could never talk about the fire at all, instead was plagued with horrible nightmares about it, and in later years hated any kind of change or new thing. There was never enough safety, because even locked up at night, with a window escape three feet from the bed, and fire alarms in every room — every wall — there were still those midnight what-ifs. Finally that twin tried escape through drugs, until getting help through a very wise religious counselor. Now we call that survival thing PTSD, and recognize that not just veterans of wars can suffer from it: anyone can. Including kids. The key word is trauma. My ‘survivors’ were those who had survived trauma. And Gen is a survivor of a whole lot of traumas. So here he is, a survivor who finds himself king. He has attained the pinnacle of kingship without having progressed to it by the (relatively) safe method of inheritance. Kingship can be a dangerous height to one who rises to it suddenly. The fall can be just as sudden. In this book, we see the personal as well as the political costs of kingship. Eugenides, minding the pattern with his feet and spinning the queen with one hand, had been pulling out her hairpins one by one when her back was turned. The rest of the pins loosened, and her hair dropped free. It swung out as she spun and the last of the pins bounced and slid across the marble floor. The queen was several inches taller than Eugenides, and he leaned back to counter her spin. To those watching, it didn’t seem possible that he could succeed, but with one hand, and no visible effort, he defied the laws of the natural world. Phresine, the queen’s senior attendant, watched them from behind the throne as her queen danced like a flame in the wind, and the mercurial king like the weight at the center of the earth. Faster and faster they moved, never faltering, until the music shrilled at an impossible tempo and the pattern gave way to a long spin, each danger reaching in with one hand and out with the other, holding tight lest they fall away from each other, until the music stopped abruptly and the dance ended. Like those hairpins, Gen skillfully plucks away at Costis’s assumptions and prejudices. Winning this single subject is important to Gen, which demonstrates how he wins over a difficult kingdom. With the fourth book, we take yet another step further away from Gen as we return to first person narrative, this time with Sophos, whom we met in the first book. And again we have a first person narrative, alternating with an observer’s third. For a good part of the book Gen is not present on stage at all, though the effect of his presence is felt, and the consequences of kingship become important in the second half. Also the costs. This book felt to me like it was setting up an arc that will show us Gen’s apotheosis as basileus: no longer can he rely on being the trickster, or use a façade of foolishness as a tactical advantage. That leaves me wondering about the emotional cost Gen is paying, for we get a hint that there is a tremendous personal cost when kings make certain types of decisions. I look forward to future books exploring that and other questions that occur to me every time I reread the books. Because a great book rewards rereads as well as that first exciting discovery: in great books, there is always something new to discover. Thank you, Sherwood! I was thrilled when I received this detailed analysis of the series from Sherwood. It highlights some of the reasons why I love MWT’s books. Do you agree or disagree with what Sherwood said? Let’s hear it in the comments! Sherwood, thank you so much for a powerful analysis of these books I thought I knew so well–you made me think about them in new ways, especially with regard to the overall arc of Gen’s development toward basileus. I’m intrigued by the idea that the difference between a hero (or king) and a Mary Sue/Marty Stu is the element of sacrifice. And thanks, Chachic, for dreaming up and hosting this event! Kate, I have to agree with you. I love how Sherwood broke down the books and analyzed them one by one. I never really felt that what happened to Gen in QoA was unjust but like Sherwood’s students, I just couldn’t explain why I felt that way. Another reason to love the series? You think you know it so well but then someone presents new concepts that never even occurred to you. Thanks for dropping by, I hope you enjoy the rest of the posts this week. 🙂 I actually thought of this event one night a few weeks ago when I couldn’t sleep. Kate: I firmly believe that we feel the power of heroism the deeper when it has been earned, and MWT does this exquisitely. And it WAS skillful. Gen does so many things spontaneously, but we learn at the end of KoA that it was all–or at least mostly–a careful plan from the start to alter the way Eugenides, as king and as man, was perceived. And, as difficult as it was for solitary trickster Gen, who lies even to himself, he did it by revealing himself to everyone. A difficult thing for him. So many things have taken a toll on poor Gen. I had to look up “apotheosis” as well and when I did, I realized that it’s perfect for Gen’s situation. I wonder what your idea about the series end is? I try not to think about the next books too much because we still have to WAIT for them. This is a wonderful analysis. (Though I would expect that. I love reading Sherwood’s writing, fiction and pieces like this.) I am also interested in seeing Gen’s arc as King and where it is going from Conspiracy. I came away from that book with the impression that we are being shown a person transform from a man into a Legend. Apotheosis is a good word (not only descriptively but I like the way it sounds). I am reminded of the stories of King Arthur and how they became more about those who served him than the king personally, though his presence is always felt. As each book pulls further away from Gen’s perspective and yet his character keeps growing larger I see a similar scenario playing out. I am impressed that so far Ms. Turner has demonstrated well the personal cost of going from man to legend. It is what sets her work apart from so many others. I confess that I knew Gen was hiding something when I read The Thief as well, but I guessed wrongly what it was. I am reading the book with my homeschool co-op students this year and am interested in seeing how it unfolds from their eyes. Thanks for the wonderful, thought provoking post Sherwood! I came away from that book with the impression that we are being shown a person transform from a man into a Legend. -> Excellent point! And the King Arthur example illustrates that. You’re probably right and this is how the rest of the books will play out but it kind of makes me sad because I want more Gen in the next books. I read Sherwood’s “Crown Duel” while in that obsessive age range (13-16) and remain a huge fan to this day – so getting her thoughts on the Queen’s Thief series (another obsession) is a real treat! Thank you! Thanks, Sherwood, Chachic, everyone! I am having so much fun! I love your writing, Sherwood! Andre Norton was a favorite and I was introduced to your work through your collaborations with her. This analysis of MWT’s works was brilliant. I’m going to show my total ignorance here, because why shouldn’t we admit when we are flabbergasted by something?? I had no idea Andre Norton was a she. Glad you’re enjoying the posts, Tiegirl! I love Sherwood’s writing too. 🙂 I wonder what’s your favorite Sherwood Smith novel? Yep, I agree, this analysis is brilliant. I love how it makes the rest of us think of the series in a different way. PS: Checkers, I also didn’t know that Andre Norton was female! Yup, Andre Norton was female. This was a great review and wonderful analysis. Especially that bit about heroes — when I read it I was like, yes! That! It’s like Sherwood was able to explain what we were all feeling, right? I mean I didn’t know why I felt that what happened to Gen wasn’t unfair (when I reread the QoA, it seemed like even Gen didn’t blame Attolia for what happened – he kept blaming the Mede). But I never would have been able to explain it the way Sherwood did. Lizzy, to be honest, I can’t even remember how I felt while I was reading The Thief for the first time! I definitely did not see that twist coming. I can’t remember if I had a feeling that Gen was hiding something or not. Thanks for this great review and analysis! I would say something intelligent, but my brain is busy rereading the books in my head now. I should probably go pull out my copies and get my eyes to help my brain along. Yes to getting your copies out and rereading the books. I reread The Queen of Attolia for this week’s celebration. 🙂 I want to reread The King of Attolia as well but Queen’s Thief Week is keeping me busy. Glad to know these posts are encouraging you to reread the books. This is such a great post! I have to admit that when I read The Thief the first time, I was totally surprised by the twist. But when I re-read it immediately after, I noticed all of the clues I missed the first time around. As for A Conspiracy of Kings, I still haven’t read it, but this post made me want to pick it up already! Oh my goodness…two of my most favorite series in one place!! Ms. Smith, I love that you pointed out that rare scene from Phresine’s POV, I think she probably has ta fascinating perspective of Gen and Irene, and I would love to see more from her! Yay, another Sounisian who’s a Sherwood Smith fan! I didn’t know the origins of the terms Mary Sue and Marty Stu either so it was interesting to know more about them. Have you read Sherwood’s other novels? Aside from Crown Duel, I also loved the Sasharia en Garde duology. I never thought of Gen as mopey either! I agree that his moments of despair were believable. And when he finally emerged from hiding? He was brilliant, as expected. Well, that surely was an amazingly well thought out response to these books. Seriously, very, very cool. It IS very cool. I seriously love all the guest posts that were submitted for Queen’s Thief Week. I could never have come up with all of this amazing and intelligent discussions.